As the wife of the future King, Kate Middleton rarely steps out in the latest high street style. She has the pleasure of dressing herself in some of the finest clothing fashion has to offer – and that’s enough to make any fashionista jealous. Although she has stylists to choose her outfits, it’s no secret that Kate has a soft spot for Alexander McQueen. Who doesn’t? In 2014, she wowed fans across the world when she wore this beautiful blue Alexander McQueen coat, and it seems as though we weren’t the only ones to fall head over heels for this belted wonder. She wore it twice that year and then whipped it out of the closet again in 2016. Those in the Royal Family have certain rules and regulations to follow in terms of their appearance, and they always have to be regal and conservative with their outfits. This isn’t a problem for Kate Middleton, who seems to have mastered this style. She is often spotted in skirt suits, and this is one of her particular favorites. This fire-engine red Luisa Spagnoli skirt suit made us all a little hot under the collar when she debuted it in 2011. It seems to be one of her favorite pieces in her extensive wardrobe, because Kate has since worn this two other times, in 2014, and 2017. We don’t blame her, because we’d be wearing this every single day. Over the course of her relationship with Prince William, Kate has experimented with her style and her appearance numerous times. Yet, it seems as though there is one aspect of her wardrobe that she can’t part with. Whenever she can, Kate blows us over with her ability to rock a coat dress. In 2012, Kate honored her Scottish subjects with this plaid Alexander McQueen coat as she visited St. Andrew’s School. This wasn’t the last time we saw this coat, though, as she whipped this number out again in 2013 during the Royal Christmas celebrations. You know an outfit is special when you wear it during the holiday period. She even found a fascinator to match! Burgundy is one of those colors that just seems to go with everything, which is probably why Kate Middleton has decided to rock this outfit more than once. In fact, she first wore this Paule Ka skirt in 2012, when she wore it with black stockings and a floral shirt underneath a matching burgundy blazer. However, she took this number up a notch in 2017 when she donned this outfit once more. Swapping the floral shirt for a black turtleneck and knee-length boots brought the ensemble into the 21st century, and it’s safe to say that we were utterly in love. It seems she loved it so much she reprised this outfit later on with simple black heels. Can you pull off the color yellow? It takes a certain kind of person to pull off this color, and Kate Middleton has been blessed with that ability. 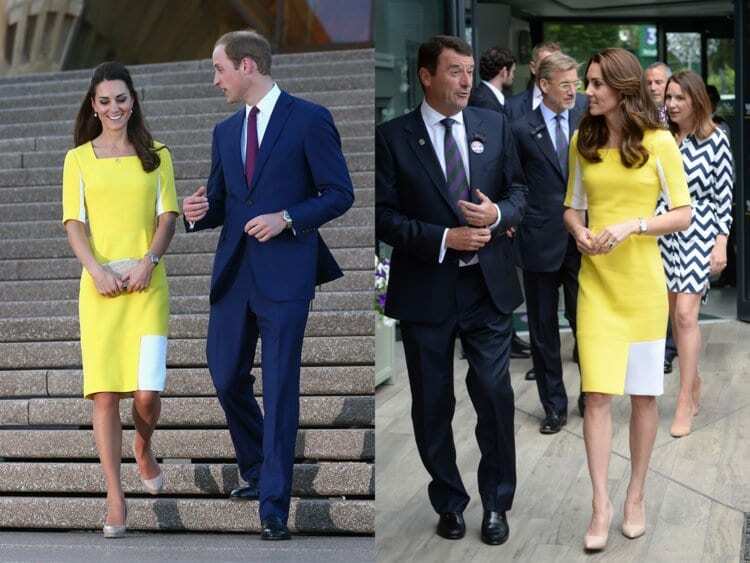 Contrasting perfectly with her brunette locks, Kate always looks lovely in yellow – and this dress is no exception. This Roksanda Ilincic dress featured white inserts to break up the block color, and it was the perfect mix of fun and formal. That’s probably why she wore it for the first time in 2014 when she went on official business to New Zealand. Two years later, she dug this number out of her closet again for a trip to Wimbledon to watch the tennis. As a member of the Royal Family, Kate Middleton gets to dress up as a Princess on a regular basis. She dons some of the most beautiful gowns, and she even gets to wear a tiara every now and then. But did you know that Kate doesn’t get a new gown for each event? While attending a Royal event in China in 2015, Kate wore this beautiful red Jenny Packham gown. She coupled this look with an elegant tiara and silver jewels. However, it seems as though she wasn’t ready to send this gown to the Goodwill, because she rehashed this dress in 2016 while attending an event at Buckingham Palace. Kate Middleton has the magical ability to transform the same outfit for two separate occasions, and that’s exactly what she did with this Alexander McQueen sweater dress. She first wore this cream and navy dress during a Canadian visit in 2011, and her stylish updo complimented the chic and formal nature of the event. Nevertheless, she wanted to switch up this outfit a year later for a Wimbledon event. To watch the tennis, she showcased her trademark curls with the sweater dress, and we don’t know which one we love more. 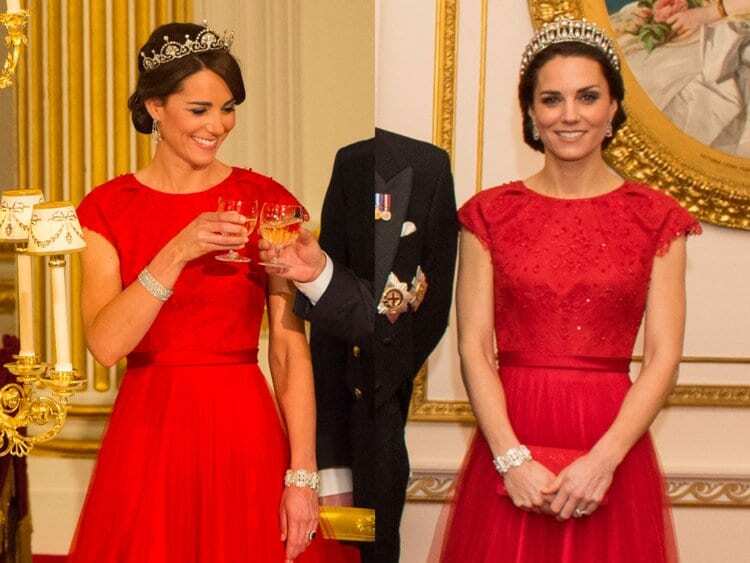 Kate Middleton has shown her allegiance to various different fashion designers in the past, and we all know that one of her favorite designers in Jenny Packham. This was clear to see in 2012 when Kate wore this incredible teal gown alongside her husband. Six years later, Kate proved that she was still an avid Jenny fan because she whipped this gown out of the closet for the second time. While her hair was different, she even managed to find the same clutch for this Royal event. What a look. It should come as no surprise to learn that the Duchess of Cambridge has an incredibly lavish lifestyle. When she’s not spending time with her family, she is attending high-profile Royal events that require a strict dress code. This beaded Jenny Packham certainly hit the ticket when she wore it for the first time in 2011, as Kate decided to wear it again in 2016. She looks just as fabulous at both events, both with loose locks and with a beautiful updo. Once again, she’s even managed to find the same clutch bag! When Kate Middleton makes her way across the globe for official Royal business, she often likes to wear designers within those countries. That’s why she donned this beautiful white dress when she made her way to Australia in 2014. It seems as though she was so impressed by the Australian Zimmerman label that she decided to take this particular dress home with her. A few months after her return to the United Kingdom, she whipped this dress out again for a trip to Wimbledon. She’s all about embracing that culture. Over the course of her life in the limelight, fans of Kate Middleton have come to the conclusion that she just knows how to rock a floral. In fact, Kate’s most popular looks have been floral dresses and skirts, and this is one of them. This white and blue L.K Bennett sent fans wild when she wore it for the first time in 2014, and they were just as impressed when she wore it again two years later. It’s cool, it’s casual, and it’s chic, and it’s perfect for the Duchess. Kate Middleton is the kind of woman who can pull any color off. She could wear a rainbow dress and would still manage to look sleek and sophisticated. Because of this, fans of the Royal were a little jealous when Kate stepped out in this lavender Emilia Wickstead dress in 2017. Not only was the color something special, but the cut and the shape perfectly accentuated her impressive figure. She must have thought so too because Kate wore the same dress a year later in 2018. Can we borrow it when you’re done, Kate? We could write about Kate Middleton’s coat dresses all day, because it seems as though she rocks a new color and style every single day. At least, almost every day. In 2012, Kate first debuted this sleek and sophisticated Christopher Kane coat dress, and it was perfect for her Royal engagement. Two years later, she dug this coat out of the closet again for another Royal event, and this time she teamed it up with a matching fascinator. We love the color, we love the style, and we love everything about it. Nautical fashion is the kind of trend that never goes out of style, and Kate has not shied away from these looks in the past. In 2011, she wore this Alexander McQueen co-ord. It consisted of a navy blue skirt, complete with slits and gold detailing, and a white shirt with similar gold detailing. The media went wild when they saw the Duchess try something new, and they had exactly the same reaction when she wore the outfit again in 2014. Like a fine wine, this outfit just seemed to get better with age. It’s very rare to see Kate Middleton wear pants because most women in the Royal Family tend to feel more regal in dresses and skirts. Thankfully, Kate knows exactly how to pull off any type of dress, even ones that many women wouldn’t dare touch. In 2012, Kate donned this grey Orla Kiely dress that many women would class as matronly and old-fashioned. Of course, that just wasn’t the case with Kate, who looked youthful and beautiful. She looked just as classy when she rehashed this dress in 2015. Lace has always been associated with regality and money, so it should come as no surprise to learn that Kate has worn lace gowns on more than one occasion. In 2012, she wore this black Temperley London number, and she instantly caused a storm. Heads couldn’t help but follow the Duchess wherever she went, and it seems as though she also loved the way she looked in this outfit. She brought this gown out again a year later, in 2013, where it looked just as fabulous as it did the first time. St. Patrick’s Day is a huge event in the United Kingdom, and the Royals always put on a united front to celebrate this national holiday. In 2012, she got in the green spirit with this green Emilia Wickstead coat, and fans across the world instantly fell in love with this new addition to her wardrobe. It seems as though this dress became somewhat of a St. Patrick’s Day tradition that year, as Kate dished this coat out again for the holiday the following year. The second time, she teamed it up with stockings to shield herself from the rain.